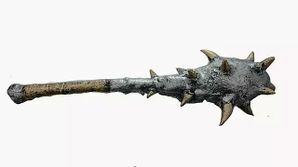 The Mace of Amnesia lay forgotten for centuries before an adventurous heroine delved deep enough into the Crypt of Medial Temporal Lobe Damage to stumble upon it by accident in a long-forgotten chest. And there it remained for several more centuries, as, with a full inventory, the heroine was unable to take it back to town, nor able to remember where she had found it later. Or that she'd found anything at all. Or anything at all. It wasn't until hundreds of years later that another enterprising heroine stumbled upon the same chest in the same crypt, falling quite heavily and bumping her head badly on the crypt's ancient, cold, hard, stones. When she awoke she was surprised and delighted to find the Mace of Amnesia gently resting against a painful bruise on the left side of her head. To this day we don't know the name (or origin) of that lucky young lady, but if we did, we would use it to thank her for bringing the Mace of Amnesia back to Godville. Also for beating monsters senseless with it and taking all their items of value from them. This page was last edited on 24 November 2018, at 06:11.